Today, the Association co-hosted United States Senator Roger Wicker, of Mississippi, for a breakfast meeting at the Association offices in Fresno. Issues discussed included water, immigration, trade, pesticides (in particular neonics), crop insurance and other regulatory matters. Senator Wicker sits on the Armed Services, the Budget, the Commerce, Science and Transportation, the Environment and Public Works, and the Rules Committee. Most importantly for our interests, the Senate Environment and Public Works Committee will be involved in any federal legislation involving water supply or attempts to address the Endangered Species Act (ESA). 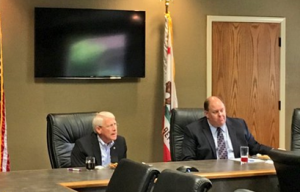 Also participating in the meeting were Western Agricultural Processors Associations, California Citrus Mutual, California Fresh Fruit Association, Committee for the Advancement of Cotton, Nisei Farmers League, and several individual farmers and ranchers from throughout the valley. This entry was posted in NEWS & ISSUES on May 5, 2016 by ccgga.